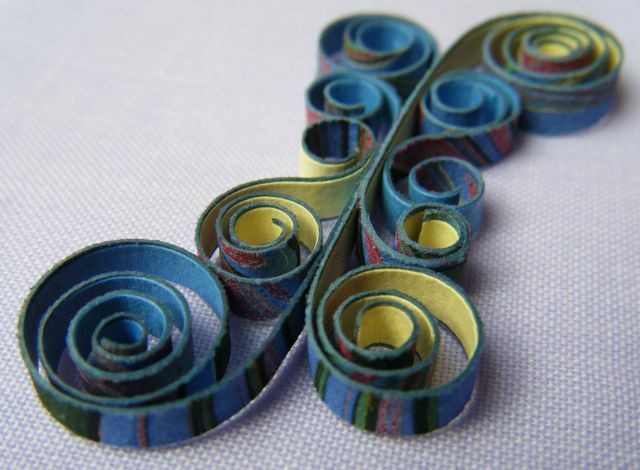 In my last post, I shared some details about how I have been quilling with some of the gorgeous hand-marbled paper that I’ve recently bought. It is very easy to roll after being cut into strips, but I also wanted to try using it as a background to some open ring coils – and this is the result! For each petal of this ‘floral creation’, I made a ring coil using 3mm purple strip, wrapped four times around a dowel, gluing along the whole length of the strip as I wrapped. After removing it from the dowel, I shaped it into an oval, then wrapped it four times around with gilt-edged gold strip. (I find you need to wrap an outline strip several times for it really to make a visual impact.) The resulting ring coil was very strong and easy to glue firmly on to the marbled paper. 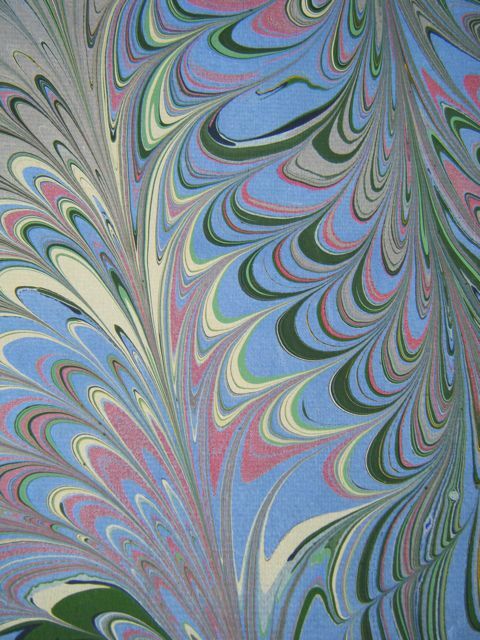 I made sure to spend some time selecting an ‘interesting’ section of the marbled pattern that would be framed by the ring. Once the glue had dried, it was simply a matter of trimming closely around the outside of the ring with scissors. For the green sections of the piece, I tried to create some unusual foliage by threading tightly coiled tendrils through the apex holes of four loosely formed Pixie-Hood Loops. 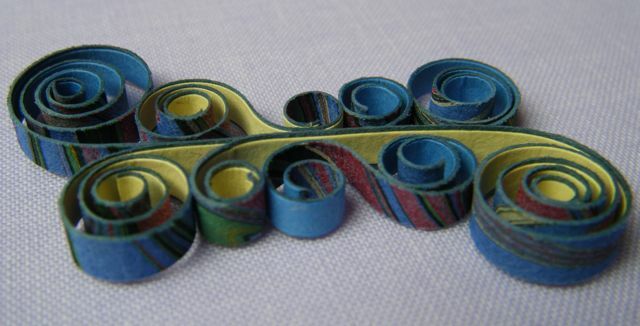 Pixie-Hood Looping is a technique found in antique quilling which has recently been endorsed as an officially recognised quilling shape by The Quilling Guild. I am pleased with the impact of the shapes and colours in this piece, and am now looking around for a suitable box frame in which to mount it. 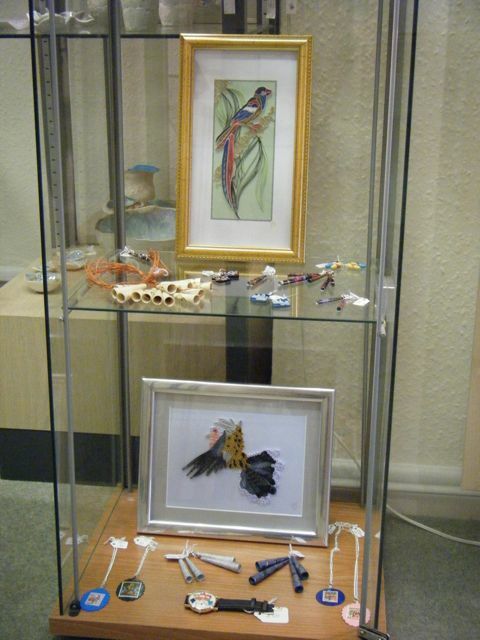 Hopefully this will end up for sale in the cabinet which I’m proud to say now contains several other pieces of my work at Gallery Fifty Five. 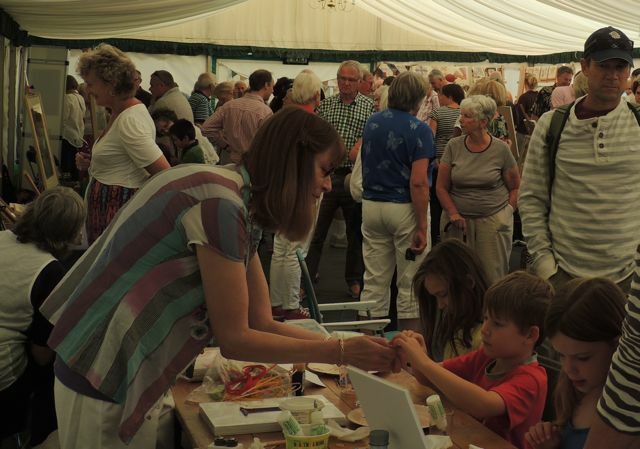 I’m always on the look-out for potential new quilling materials, so was delighted to make the acquaintance of a hand-marbled paper supplier last week at the fabulous Taunton Flower Show. Marshall and Fuller produce an amazing range of uniquely patterned papers whose weight is ideal for quilling applications, so I just had to treat myself by buying a sheet to play with. Then, I tried rolling up some long triangular sections of the paper to make some beads, and I’m absolutely thrilled with the result! 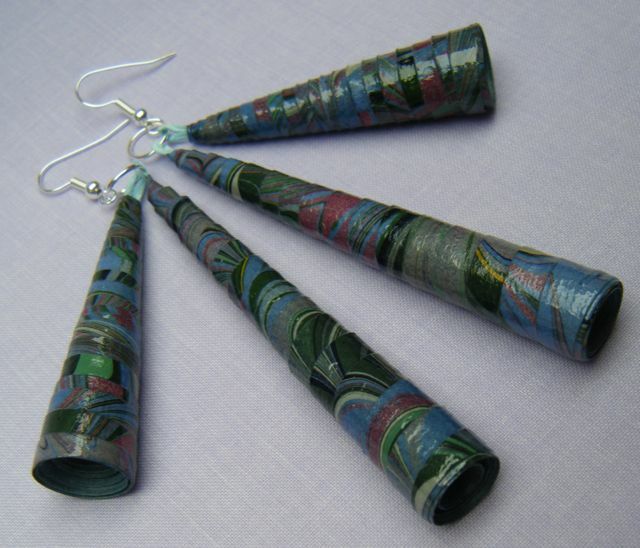 The little sections of pattern combine together in a really attractive and interesting way, and (although I say it myself), I think these earrings are absolutely stunning! 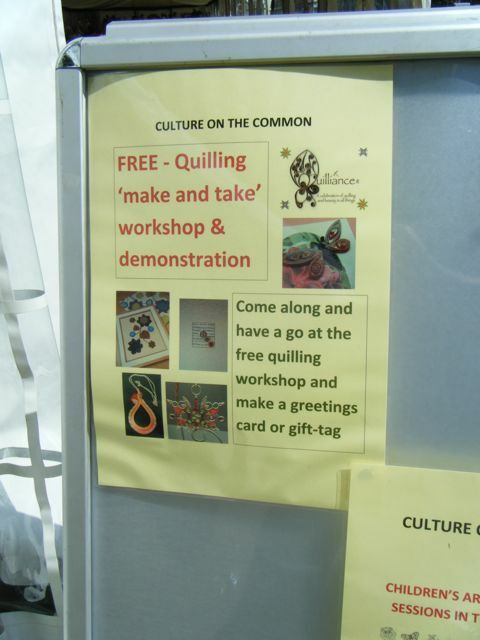 Yesterday, I had the privilege of conducting a ‘make and take’ quilling workshop at the annual ‘Culture on the Common’ event in Hartley Wintney, a village in Hampshire in the south of England. 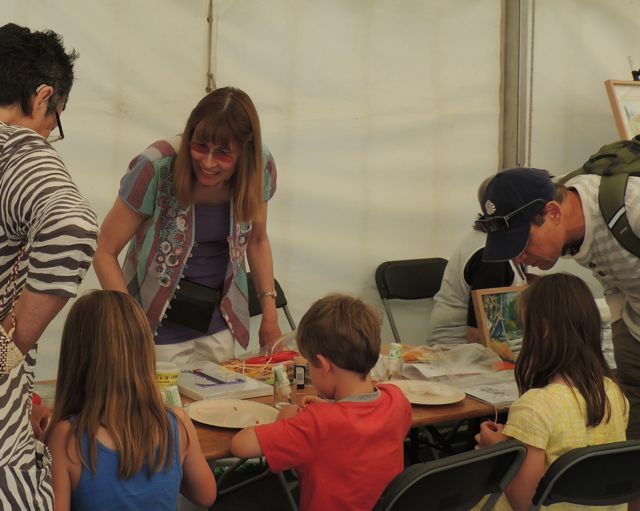 I had taken along a quilled project to work on during ‘quiet moments’, but I never even touched it as I was besieged by a succession of eager children (and their parents!) 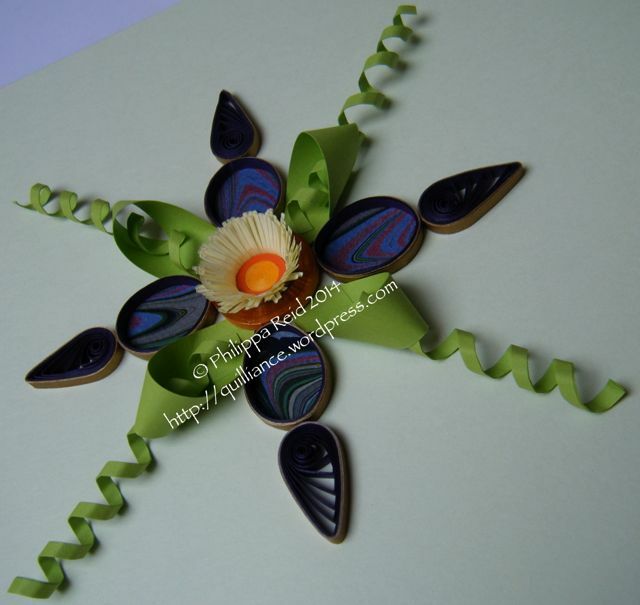 who couldn’t wait to create their first quilled flowers. Some of them were as young as four years old. Pictured here (with her parents’ permission) is a young lady named Celia who proved herself to be a natural quiller right from the start. 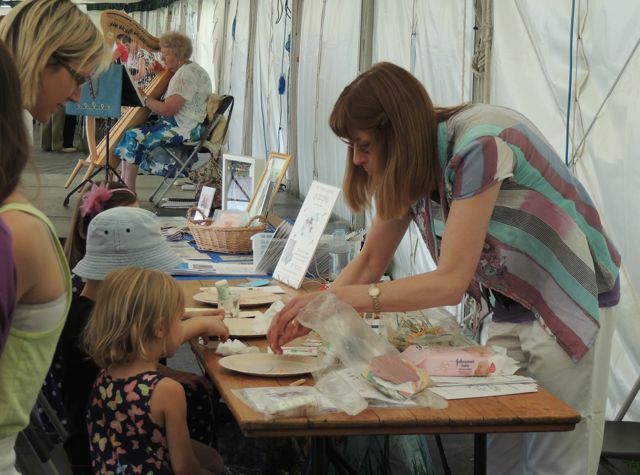 As soon as she had mastered the rolling of a coil, she was well on the way to creating her first flower with minimal guidance from me (which was just as well, as other children were soon gathering at my display table and clamouring for my attention). It never ceases to impress me how quickly young children can grasp the basics and see the potential of creating art through the imaginative assembly of quilled shapes … and what firm ideas they have in terms of colours and shapes which quickly supersede any pre-planned project I have intended for them. 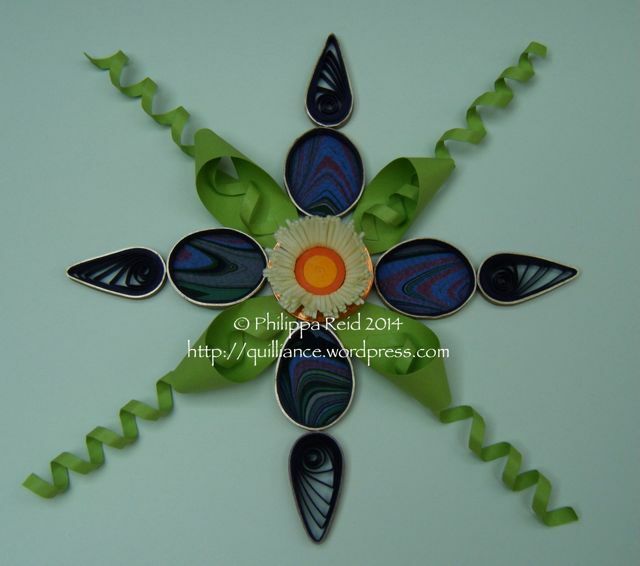 We started off by making small quilled daisies (as described on my workshops website Learn To Quill), but soon digressed into the creation of extra petals, tulip flowers, leaves and butterflies. The boys were instinctively drawn to the cog wheels of my crimping tool, and soon became engrossed in the processing of long crimped strips which their sisters then began to roll into coils. Celia (my star pupil!) 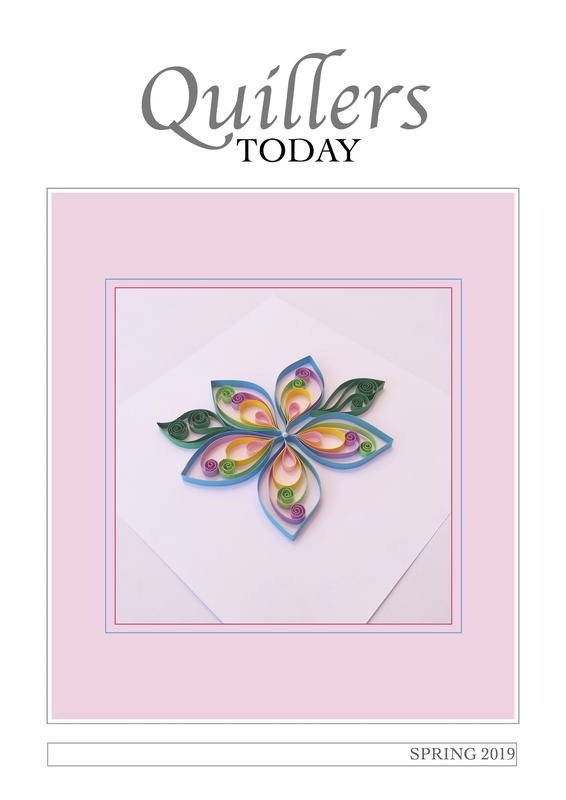 created her first quilled card with the daisy and a tulip, before vacating her seat at the table for another of the waiting children. 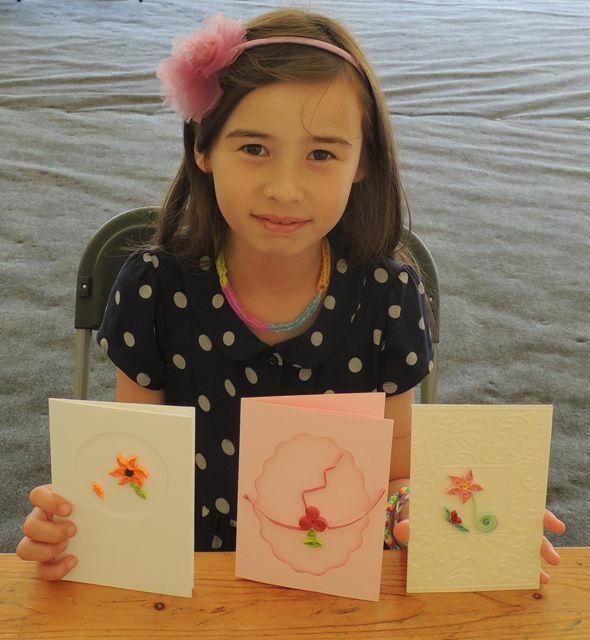 It was not long, however, before she came back for more, and with just a little guidance from me was quickly reproducing another quilled flower design that she had seen on one of my cards … followed by a third design that she made up all by herself. 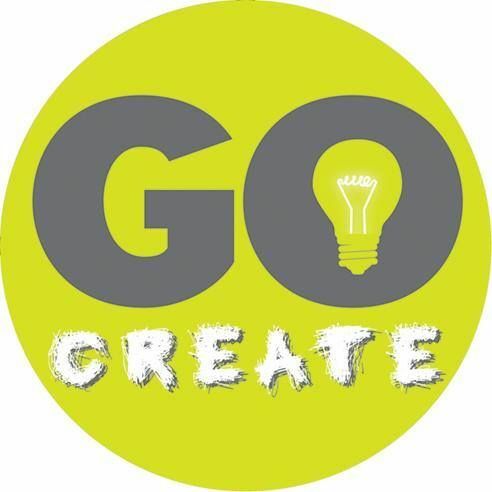 I always find it fascinating to witness how some people always seem to need a pattern to work from, while others can produce imaginative creations with quilling straight out of their heads – and it obviously starts in childhood. Celia certainly needed no prompting to place herself in the latter category! Did I help to inspire a new generation of quillers? Only time will tell … but the experience of working with these brilliant kids has certainly made me smile.